Gifts from Wicked Wicker, LLC: Keeping it Cool! Wow....I cannot believe that today is already September 1st and that the last weekend of summer is almost here! While surviving the "haboobs" and "excessive heat warnings" (which we are continuing to participate in, yikes!) for the Phoenix area, cooling off was my summer mission for wherever I decided to travel. I'm following you from Mom Mart's Social Media Monday hop! I follow via GFC, Facebook, & Twitter. I hope you had a great Labor Day. Greetings from Jamaica. We are still feeling the summer heat here. Thanks for visiting my Blog. I am happy to become a Follower of your Blog. Hello! I am a new follower from the Thursday Friends Cafe Blog Hop. Please feel free to follow me back at Horseshoes and stop by anytime! If you ever host giveaways or want to add any I have an always open Giveaway Linkie on my site. Sad to see the Summer goes away.. this summer has been a wonderful one for our family.. I love that picture. Is it Niagara Falls? 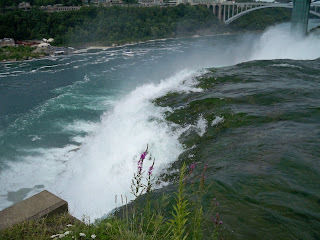 Yes, it certainly is Niagra Falls! I spent a month in San Diego with my mom while my husband was at military training. Then in August we moved to San Antonio just in time to feel the heat from it's hottest summer on record! I stumbled this post. If you get the chance I would love a comment and stumble back. Hey, I'm following you through the blog hop, be sure to come follow mine http://skylarinc.blogspot.com/. I didn't really get to do a whole lot over the summer, I'm pretty broke and not having a lot of money makes it hard to get to do a lot or travel. It was pretty boring actually. Maybe next summer will be better. I loved this summer (spent 2 months at the seaside) and it's very pity to see it go. I've stumbled this post. Thanks for stopping by on Tuesday! Thanks so much for the stumble - I am now following & I hope you'll join me too! If you love chocolate, I have a FABULOUS giveaway I just posted - please stop by - it would make a wonderful gift too! Hi. Following back from Pawsitive Living.